“Which ending did you get?” This question dominated social media for a few days as millions of people experienced Black Mirror: Bandersnatch. It’s an interactive episode of the sci-fi thriller show that required Netflix to adapt the way the way their software works. While there are 5 “main” endings, there are at least 10 different endings with over 1 trillion total permutations through the software. It’s an ambitious feat of storytelling. While Netflix has adapted interactive narrative to the digital age, it’s nothing new to the tabletop world. In fact, interactive narrative is experiencing a bit of a renaissance right now. These tabletop games give you the opportunity to drive and influence a story and don’t require any sort of technology adaptation. Bandersnatch’s main character – Stefan Butler – is in the process of adapting an old fantasy Choose Your Own Adventure (CYOA) novel into a video game. Appropriately, our first game is a tabletop adaptation of a classic CYOA novel. House of Danger shares a name with a classic novel, however, the board game is a wholly new adventure. In the tabletop version, you’ll step into the shoes of a psychic investigator exploring a mysterious local house. The primary exploration mechanism is driven by decks of cards. The story is split into 5 chapters; in the first, you’ll explore the grounds of the house and attempt to gain entry. Like the original novels, the fantastical story branches into the worlds of sci-fi, time travel, aliens, and monsters. One of the new elements afforded by packaging this as a board game is the addition of an inventory. In addition to the story decks, a clue deck will provide items and premonitions that come in to play as you continue the adventure. For example, finding a flashlight – and the batteries to power it – may open branching choices down the road. 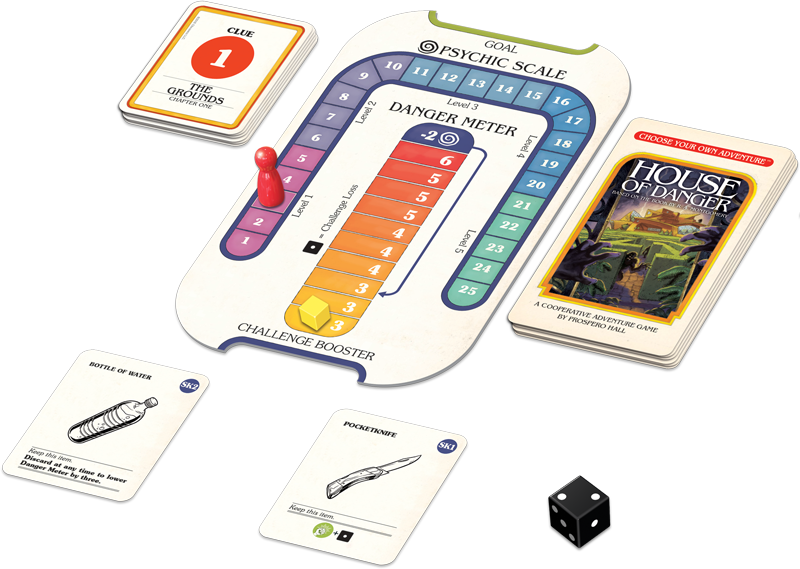 Oh, and for those of you who remember sticking 3, 4, or even 5 fingers in the book so you can go back and explore different options, House of Danger even includes a system for backtracking. Legacy of Dragonholt was released by Fantasy Flight Games with little fanfare. It quickly became one of my favorite games of the year and think it has some truly innovative combat and conflict resolution systems. Like House of Danger, Dragonholt is primarily a written narrative. The story unfolds over a number of softback tomes included in the package. Story paragraphs will end with a choice or instruction that least to another numbered paragraph elsewhere in the booklet. Character and Story sheets contain expansive grids of squares that you’ll check as you play. These represent everything from damage to forks in the story. One of the novel systems I enjoyed is the traditional roleplaying character creation element. You and the other players will create characters of different races, skills, and abilities. The game is set in Terrinoth – Fantasy Flight’s fantasy universe – which will be familiar to many tabletop gamers. These skills and abilities will inform future choices. Dragonholt also gives you the ability to grow your character. Events in the game will often direct you to check boxes representing experience. Check enough and you’ll advance those skills and become more powerful. This checkbox system which seems so simple also gives the narrative the ability to react and adapt to the choices you make. Anger a character and you’ll check “V7”; future interactions with that character will change if “V7” is checked. Dragonholt is also one of Fantasy Flight’s most diverse story worlds. Player characters and NPCs alike come from a variety of races, genders (non-binary inclusive), and romantic orientations. All of these come into play in the story as the game provides romance options familiar to anyone who has played a BioWare RPG, marriage options, and gives you the opportunity to wrestle with the prejudices of this fantasy world. For parents, it’s worth noting that the story can be both dark and gritty, with murder and political intrigue throughout. Where our previous titles explore interactive narrative through next, Van Ryder Games has published a series of interactive stories in graphic novel format. There are 5 books currently available running the gamut from the Old West to Sherlock Holmes. Like Dragonholt you’ll first create a character and track progress using a character sheet. The addition of art and images to the CYOA system allows these graphic novels to incorporate elements you may have seen in Escape Room games. Clues and puzzles exist in the art, as do hidden numbers and symbols that may help you make better choices or even offer unique options. Can you find the hidden number in the image below (no spoilers – it’s a modified image from the intro presented by Van Ryder on their initial Kickstarter). Each book offers hours of gameplay and that’s before you try to track down all the included achievements. Looking for more ways to explore narrative in games?